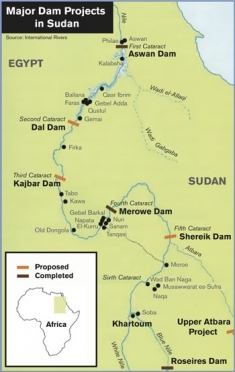 The Merowe Dam in Northern Sudan is one of the world’s most destructive hydropower projects. Built on the Nile’s fourth cataract between 2003 and 2009, and inaugurated in March 2009, the dam created a reservoir of a length of 174 kilometers. With a capacity of 1,250 megawatts, the project doubled Sudan’s electricity generation. It displaced more than 50,000 people from the fertile Nile Valley to arid desert locations, because of the consequent reduction of water flowing downstream. Thousands of people who refused to leave their homes were flushed out by the rising waters of the reservoir. Next in line are the Kajbar and Dal dams, who add to energy generation potential but also displaced some thousands more people. Since the dam inauguration, many electricity and water outages have occurred, sometimes for more than eight hours at a time, revealing the failure of the initial project objectives. To date, all demands by local communities affected by the dam construction have been ignored, including the proposal to be resettled along the banks of the new reservoir. No proper environmental impact assessment for the Merowe Dam was ever carried out. In 2005, the NGO International Rivers received a copy of the confidential EIAR produced by Lahmeyer International and handed it over to EAWAG, the Swiss Federal Institute of Aquatic Science and Technology, to review. The review, published in 2006, revealed that the report does not follow World Bank or World Commission on Dams Guidelines on writing EIAR for dam projects. Moreover, project construction was started without approval by Sudan’s environmental ministry, which violates the country’s laws. The project also submerged immeasurable archeological treasures in its reservoir. In addition, protests intended to draw attention to the serious social impacts have been brutally repressed by police, in open violation of basic human rights. The $2.4 billion Merowe Dam was funded by China Export Import Bank and Arab financiers, and built by Chinese, German and French companies. A German engineering company, Lahmeyer International, which has played a leading role in many destructive dam projects and was tasked with producing the Environmental Impact Assessment Report (EIAR) for the Merowe dam, was debarred in 2006 from receiving World Bank contracts for up to seven years for its role in a corruption scandal on another dam project. On May 3, 2010, Ali Askouri, a representative of the affected communities, and the European Center for Constitutional and Human Rights (ECCHR) filed a criminal complaint against two executives of Lahmeyer International in Frankfurt/Main. ECCHR and Askouri state that Lahmeyer was “responsible for the planning, the entire construction supervision and the commissioning of the Merowe Dam Project,” and assert that the two defendants “had knowledge of the specific risks of continuing the dam construction project without a timely resettlement.” They claim that knowingly causing the flooding of the Amri and Manasir villages was unlawful under Sudanese and German law. . End of 2015, peoples are still protesting and denouncing “the tragic situation” they are living in since they were relocated from their villages near Merowe to the area of Emre during the construction of the Merowe Dam between 2005 and 2009. They demand improvement to the water, health, and education services in their new region, and implementation of compensation measures by the government, including completion of land surveys, settlement on arbitration cases, and the rest of the compensation for the properties lost by the construction of the dam. Project Details The capacity of the reservoir is 12.5 cubic kilometers, around 20 percent of the annual flow of the Nile. It produces 1.25 million kilowatts. The aerial transmission line is 1,776 km (1104 miles) long. Development of Alternatives An adequate compensation for all the affected population and the restoration of the area. According to International Rivers, "African countries have a huge potential of renewable energy such as wind and solar, which in many cases is not more expensive than large dams,"
Why? Explain briefly. The dam is still operating and native population have not retrieved their lands. Two thirds of affected people have not receive compensation. However, the criminal complaint against Lahmeyer International in Germany is a pioneering example of how transnational corporations can be held to account for human rights abuses on their projects. Conservation, Ecology, and Management of African Fresh Waters. Crisman, Thomas L.; Chapman, Lauren J.; Chapman, Colin A.; Kaufman, Les S.. Ed.University Press of Florida. 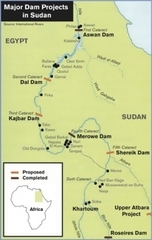 2003.
 International Rivers - German Company Brought to Justice Over Abuses in Sudan Dam?